A few years ago while shopping at Target I lost my Groovy Girl for about 8 minutes. I was terrified! I think it happens frequently to mothers out shopping. I was busy reading the label on something and she was jabbering away at me in her 5-year-old voice and I was uh-huh'ing her but my mind was elsewhere. My son was close by looking at something else when suddenly it occurred to both of us that she was no longer there and jabbering! Oh, how I suddenly missed her sweet voice. We called her name and walked around in the general area but could not spot her. When a Target employee walked by me I said "I can't find my daughter." I could feel my chest tighten and my thoughts were going crazy. That feeling is brought to life so well by Mr. Gorbachev in his picture book, The Missing Chick (2009). Mother Hen is hanging her laundry on the clothes line when Mrs. Duck stops by to chat. Mother Hen says "My seven chicks are very good helpers!" Only six chicks are helping though-OH, NO! One chick is missing and Mother Hen, her neighbors, the police and firemen all help her look. Mrs. Duck eventually finds the missing chick in the laundry basket, asleep! I adore Valeri Gorbachev's illustrations and this one is no exception. Mrs. Duck looks lovely in her polka-dot hat, dress and petticoat. Mother Hen in her apron and slippers looks so relieved when her little chick is uncovered and brought to her. Gorbachev leaves a little surprise ending that children will love to discover because they will have to find it with their eyes. Thankfully, my little chick was located just moments away as well-not sleeping but admiring accessories in the girl's section. She clearly stated she was just looking at the pretty purses! I felt as happy as Mother Hen did when the Target employee walked her to me. BTW: if you say to a Target employee that your child is missing they immedietely walkie talkie the front door area and lock down the store. I was freaked and grateful by how quickly the store responded! 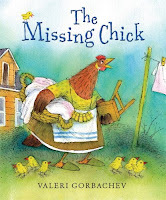 Read Planet Esme's blurb about The Missing Chick. and Seven Impossible Things Before Breakfast talks about Valeri's work. Have you ever lost track of your own little chicks?